There is a fine line between drinking and being a drunk. I love my glass of red wine with supper but I can just as easily go without it. When we are socializing the glass may turn into a bottle but I know when to stop. Not knowing when to stop is when the problem starts. For some people they should never have the first drink. You hear “I don’t drink at lunch time” from a person who has two beers with lunch. Or “I only had one glass of wine” from someone who keeps topping up their glass. These people lie to themselves and hurt the people around them. They rely on the alcohol to get through the day and their behaviour ruins relationships. These people become sneaky and defensive and their company is not something you would seek out. This becomes a problem when their partner is someone you get on with and whose conversation is interesting. Do you put up with the drunken antics for the sake of a friendship you treasure? Do you even risk cooking with alcohol for the person with a problem? Well, thankfully you can always burn off the alcohol and use the flavour of the wine. This makes it safe for both alcoholics, people who do not drink, and children alike. Before using alcohol bring it to the boil and take it straight off the heat for use in your recipe. 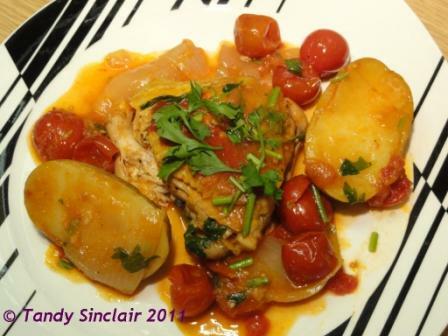 I love making a chicken tagine for a lazy Sunday evening meal, to accompany a glass of wine. Thank you so much Mary 🙂 Enjoy your Wednesday! …enjoy the tasting with Woolies!! WOW, how lucky can you be!? It is not with Woolies -I am comparing their product to a new one and then I am going to tell them what I think of it – wish it were a paid thing! Lovely dish!! Perfect for this weather! it is perfect for this miserable week! I never heat wine, brandy or the likes before using it in food, I just add it straight in – thought that would be enough to burn the alcohol off. Your chicken tagine sounds like the perfect meal for a cold winters evening.